Cloves is the aromatic dried flouer buds o a tree in the faimily Myrtaceae, Syzygium aromaticum. 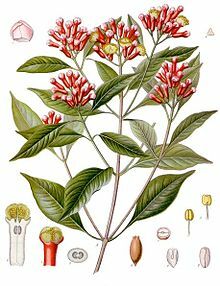 Cloves is native tae the Maluku islands in Indonesie an uised as a spice in cuisines the warld ower. Cloves is hairstit primarily in Indonesie, Indie, Madagascar, Zanzibar, Pakistan, an Sri Lanka. Thay hae a numbin effect on mooth tissues. The clove tree is an evergreen that graws tae a hicht rangin frae 8–12 m, haein lairge leafs an sanguine flouers in numerous groups o terminal clusters. The flouer buds is at first o a fauch colour an gradually acome green, efter whilk thay develop intae a bricht reid, whan thay are ready for collectin. Cloves are harvestit when 1.5–2 cm lang, an consist o a lang calyx, terminatin in fower spreadin sepals, an fower unopened petals that form a smaa baw in the center. ↑ "Syzygium aromaticum (L.) Merr. & L. M. Perry". Germplasm Resources Information Network (GRIN) online database. Retrieved June 9, 2011.